Another unusual photo submitted by 'Grandpa' (USA) who is another who has a treasure-house of old car photos. 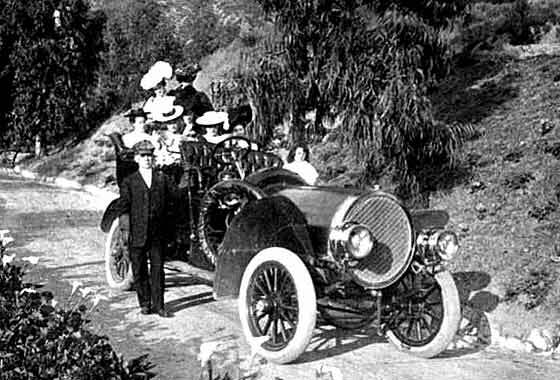 Photo taken in Southern California and he thinks the driver, standing next to the car, doesn't seem too happy with the load of female passengers. -- Although round radiators were quite popular in Europe we feel this is a home grown American car, cca 1905 National Tourer. National made horse carriages, electric cars in 1902, Petrol in 1903, and big 35/40 and 50/60 in 1905. Photo received from David Bradley (UK) saying he is trying to date the picture. 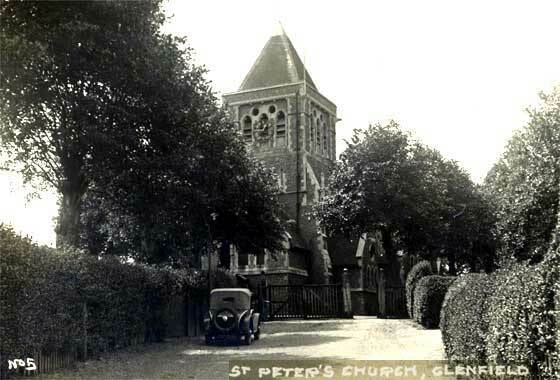 He has concluded that it was possibly taken sometime between 1904 and 1907. -- The photo is very small and pixly and we requested him to re-scan it and send it to us at BEST RESOLUTION possible, as it is the detail that provides the identification. Regretfully we have heard nothing since. It is simply not possible to identify vehicles without being able to magnify certain details which are pointers to make and date. 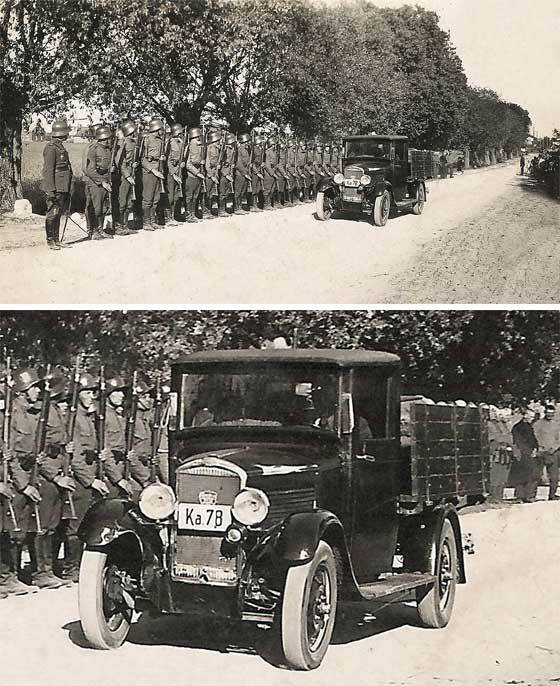 IDENTIFICATION AND DATING: cca 1906 Star "Little Star"
Another of a number of very interesting photos submitted by Jan Lundin (Sweden) showing vehicles in the 20s and 30s Scandinavia, for which he is seeking identification and dating. -- Jan has habit of unearthing unusual vehicles and this is no exception. This one is a cca 1906 Star "Little Star". Identification confirmed by John Warburton and his colleagues; marginally newer than it looks. This one may have survived in a museum in Sweden & may have recently gone to Holland. Photo received from John Dagger (UK). Boy at steering wheel is his father and the elderly gent his great-grandfather. Probably taken near Preston in Lancashire. Thought by a relative to have been an Albion. -- Registration is early 1906 Newcastle, transferred to a later car which four of our chaps agree is a French cca 1907 Darracq 10/12hp 2-cylinder, or possibly 14/16hp 4-cylinder; short wheelbase favours the former. Albion were built in Scotland; from 1909 to 1980 made lorries. 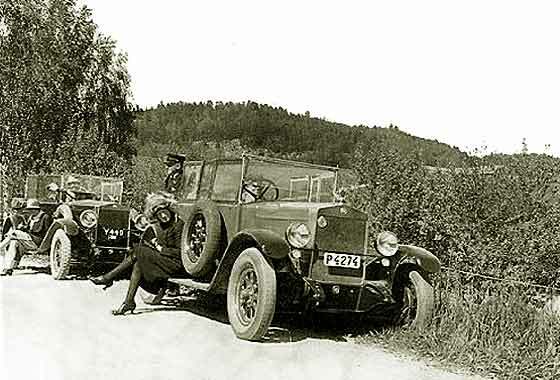 Another of a number of very interesting photos submitted by Jan Lundin (Sweden) showing vehicles in the 20s and 30s Scandinavia, for which he is seeking identification and dating. -- Jan has habit of unearthing unusual vehicles and this is no exception. This photo shows a Belgian cca 1908 FN Four Cylinder Motorcycle. Chain drive, pre shaft drive. The other photo is a British bike, a cca 1936 Royal Enfield Model L 500cc single, which we have seen on a previous photo with a Voisin. 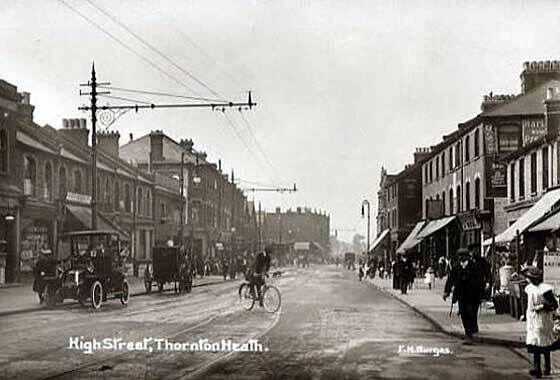 An intriguing photo sent to us by Margaret Green (UK) investigating where and when photo was taken. Her father (cross) in WW1 was a motor body builder. Photo could possibly be in Armley, Leeds Yorkshire. -- Regret we cannot answer either. Our John Warburton confirms our thoughts this is a cca 1909 Panhard & Levassor re-bodied after WW1 as it carries a cca 1921 Leeds registration. Continental windscreen suggests possibly a French built body. We repaired photo. 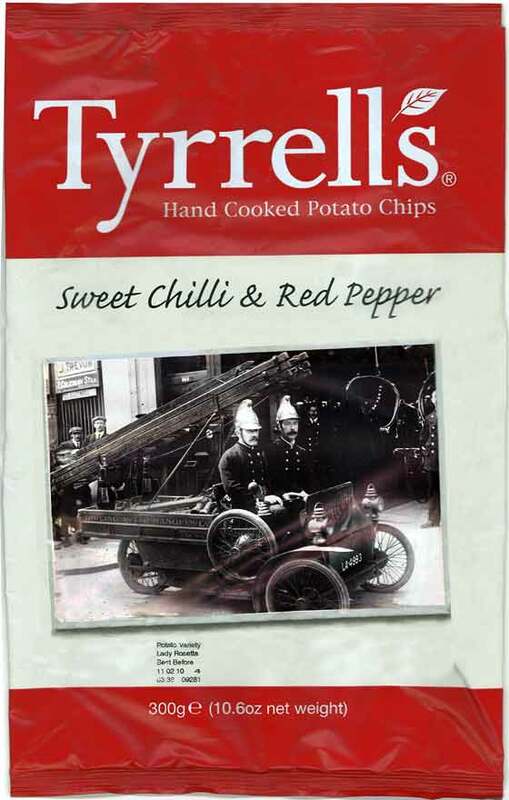 In our continuing search for the unusual, photo submitted by our Tony Russell (UK) who found it on a packet of Tyrrell's Potato Chips. He then proceeded to do some more research and advised that Girling (GB) 1913-1914 of Bedford made a three wheeled cyclecar powered by a 6hp single air cooled engine, constantly variable ratio gearbox, a third seat over the rear wheel, detachable spare wheel and tiller steering. The odd thing is that the registration LA 4993 was issued by London CC in 1910 ! 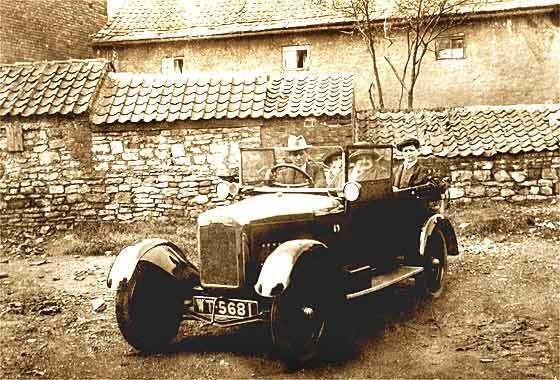 Lovely period postcard submitted by Graham Snowdon, Yorkshire (UK) showing a vehicle photographed beside a house he now owns in Normandy, France. He is having the pictures framed along with a present day photo taken from the same spot. He thought it would be good to add a note on the back about the make and models of the cars pictured. -- The header tank shape, circular badge, near horizontal dumbirons, mini upright bulkhead suggest a cca 1910 Darracq Tourer. Dashing photo submitted by Michael Love (UK) asking if we might be able to help him identify the car in the picture being driven by one of his relatives. It was taken in 1912. His name was Charles Ackland and he was a Dental Surgeon living in Bournemouth. 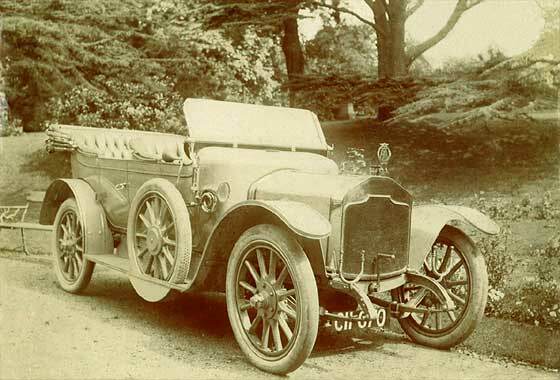 -- Although the all important feature, the radiator, is missing from the photo, we are relatively sure that this is a cca 1912 Rover 12 Two Seater. 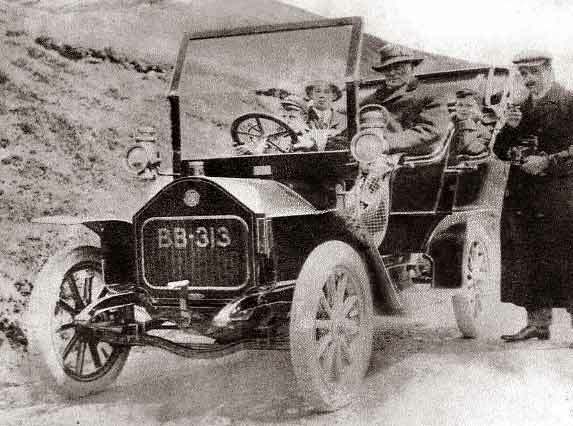 If the photo is 1912, it must be of a new car. See similar cars on Help Page 6 and 18. Photo submitted by OB Currier (USA) which was apparently taken taken in Fertile, Iowa USA in 1916. 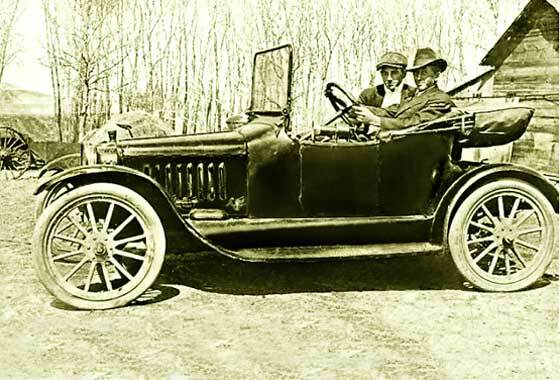 Some debate on AACA about this one but we are relatively sure that the bulge at the bottom of the bonnet a la the Maxwell plug flap, eight louvers on the bonnet with a rear catch and a middle handle all positively point to a 1913 Saxon Roadster. Saxons were started by the man behind Chalmers, made in very great numbers in Detroit, Michigan, USA, and many even reached the UK. Closed 1922. Photo submitted by Sheena Corlet (Northen Ireland) of her grandfather taken in the 1920's. Her trying to identify the car started off as idle curiosity but after very much searching it has now become a bit of an obsession! -- Annoyed me as I recognised it but could not identify it. 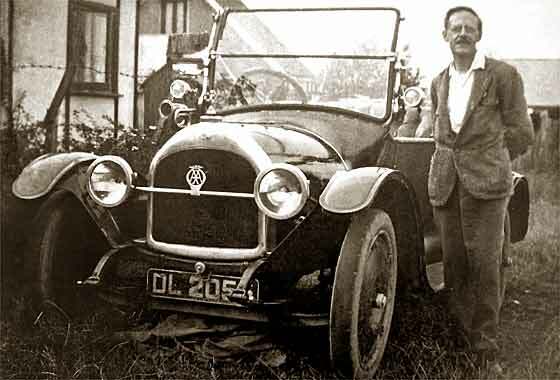 John Warburton then pointed out this was a cca 1914 Darracq 16 HP, - when it clicked into place that we once had one in the Society and I wrote about the Lockett car on our earlier website . Knew I knew it! 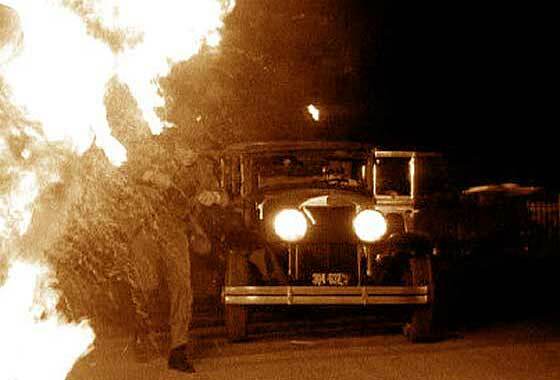 Another interesting cinema screen grab of a vehicle which appeared in the 1961 film "The Young Ones" being investigated on IMCDB. This was a film featuring Cliff Richard trying to save a youth club from being redeveloped, - involving use pirate radio broadcasts to announce their shows. -- This is a rather specific vehicle because it is a cca 1948 Morris Series Y 10cwt van with a specialised GPO (Post office) body. It would have been used by GPO for "Radio Interference" Investigations. 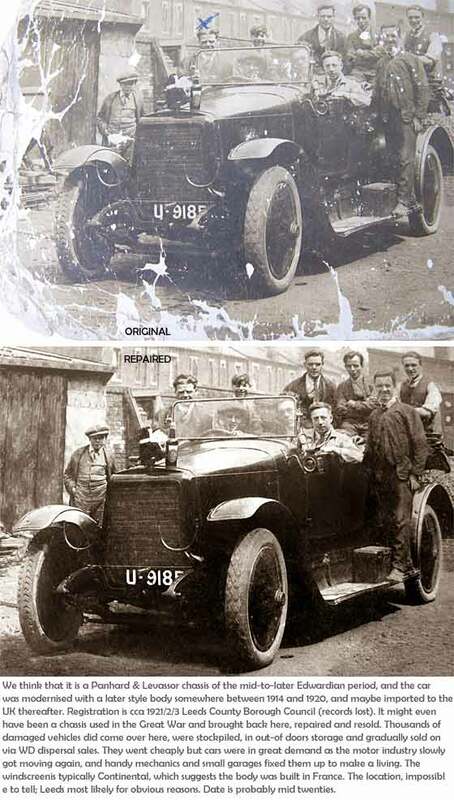 Photo received from Joan Anderson (UK) asking if we can help to identify her grandfather's car? Photo was taken late 20's early 30's. Several family members are doing the history of the family and are curious to know! -- The Registration letters 'DL' indicate that the car was registered on the Isle of Wight but no data before 1929 when it had reached DL 6030. The car is an American cca 1918 Overland 90 Country Club Touring Car, with what appears to be an British body & wheel discs. Another interesting cinema screen grab of a vehicle which appeared in the Swedish documentary film "Mitt Hjartas Malmo" being investigated on IMCDB. 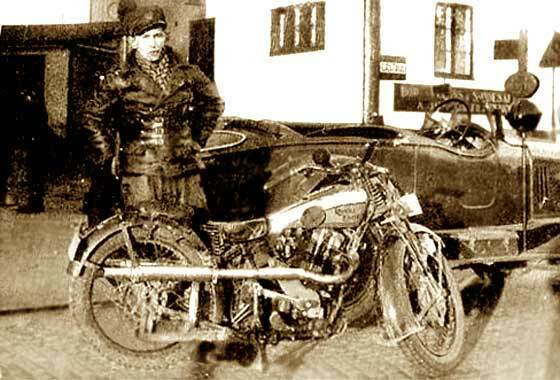 -- This is quite an unusual photo in as much as it shows a spitzkuhler cca 1921 Adler Tourer. Most Adlers are recognisable by their conventional early and post 25 flat radiators, whereas this series had the very Teutonic 'V' shaped radiator with the large Adler eagle logo. Were third largest German car maker, and still making typewriters etc. Another interesting cinema screen grab of a vehicle which appeared in the Swedish documentary film "Mitt Hjartas Malmo" being investigated on IMCDB. -- This is quite a rare car that was manufactured in Germany between 1921 and 1925 by the Mercur aircraft company diversifying after WW1. 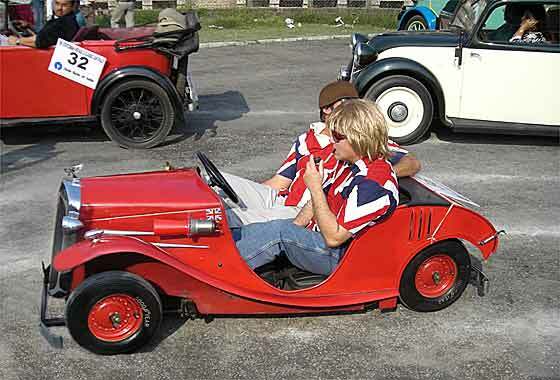 Ego was apparently a well made and reliable small car which did well in competitions. 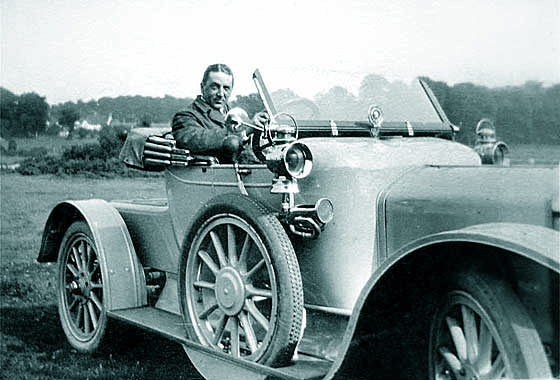 Rudolf Caracciola campaigned one of these 1922 before going to international stardom with Mercedes. Smashing photo submitted by Dave White (UK) showing great grandparents, & his grandma, dog and great uncle in the back. Smilarities with the Rover 8, but things make him think different make of car. He thought car was registered in Leeds. -- Registration is not Leeds but West Riding of Yorkshire, accurately dating the car to a cca 1924 Rover 8 Tourer. 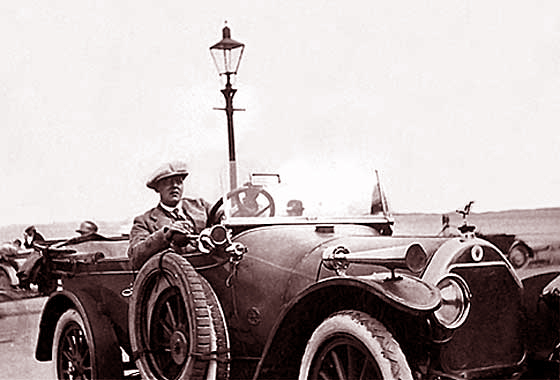 The Rover 8 was made between 1919 and 1925 and had all the features of later model which made him doubt Rover. Lovely period postcard submitted by Graham Snowdon, Yorkshire (UK) showing a vehicle photographed beside a house he now owns in Normandy, France. He is having the pictures framed along with a present day photo taken from the same spot. He thought it would be good to add a note on the back about the make and models of the cars pictured. 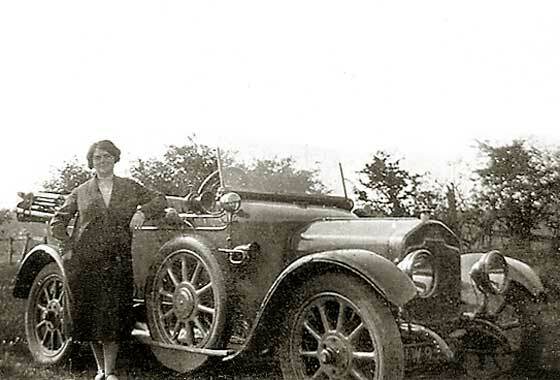 -- Photo is bit unclear but most likely a cca 1927/8 Citroen Saloon, probably C4 or C6. Difficult to tell them apart. Unusual wheels. 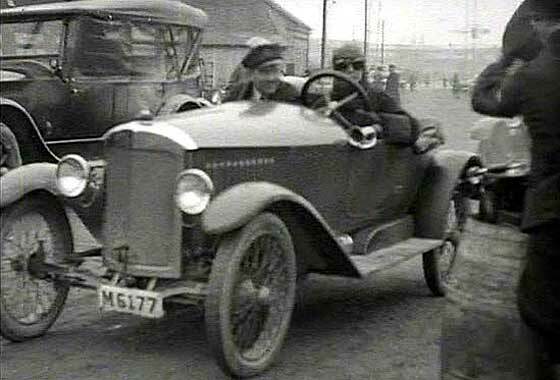 Another of a number of very interesting photos submitted by Jan Lundin (Sweden) showing vehicles in the 20s and 30s Scandinavia, for which he is seeking identification and dating. -- Jan has habit of unearthing unusual vehicles and this is no exception. There is some debate as to the models of the cars but they are both cca 1927 FIAT Tourers. The front one, double curve on bottom of front spring covering was on the 512. Photo is low resolution, but other one could be a 507. Another dramatic cinema screen grab of a vehicle which appeared in a film, but regrefully I cannot remember which one it was. The car is an American cca 1928 Graham Page. 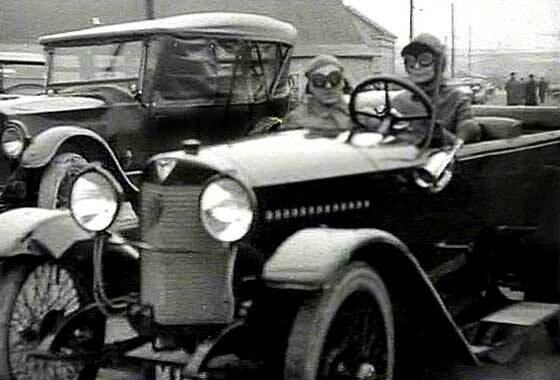 Graham page were introduced that year after the Graham brothers purchased the failing Paige Detroit Motor Co. Graham paige made 73,000 cars in 1928. Company name became simply Graham in 1930. In 1940 they made 3,000 cars. By mid 1940s were renamed Frazer, then Kaiser Frazer, merging with Willys. Interesting photo submitted by Sigis (Lithuania) saying 'My language bad. I have this picture for many years, but can't identify car. This photo was taken in Lithuania at a funeral maybe about 1930-1935. This vehicle is rare and I can't find any information about it. Thanks for any information. -- We can advise that the vehicle was made in France, and horisontal louvers confirm it is a commercial variant of a car; it is a cca 1932 Peugeot 201 Boulangere type camionnette; not many made. One of the first enquiries we received in 2001 was a photo from Smita from India trying to find out more information on the " 1903 Rutecraft Scooter Car". This turned out to be a cca 1936 Rytecraft Scootacar . It seems that there is another one in India owned by Rishi Kumar (India) who wanted another one so asked for forwarding details. Regretffully we no longer had these so could not help. We are however posting the photo of Rishi's Ryetecraft at the 2009 Calcutta Rally, still on the road. A number of photos sent to us by Kim Anderberg (Denmark) saying he was at a flee-market at Store Heddinge (60 km south of Copenhagen) and saw an old wreck of a car which looks like a Jowett Bradford. The car is in bad shape but maybe it could be of interest for somebody who needs spare parts. The car, or what is left of it, is for sale. -- We have advised our Jowett specialists and if anybody is interested we can put you in touch with Kim. Bradford light commercials were made 1946-53. 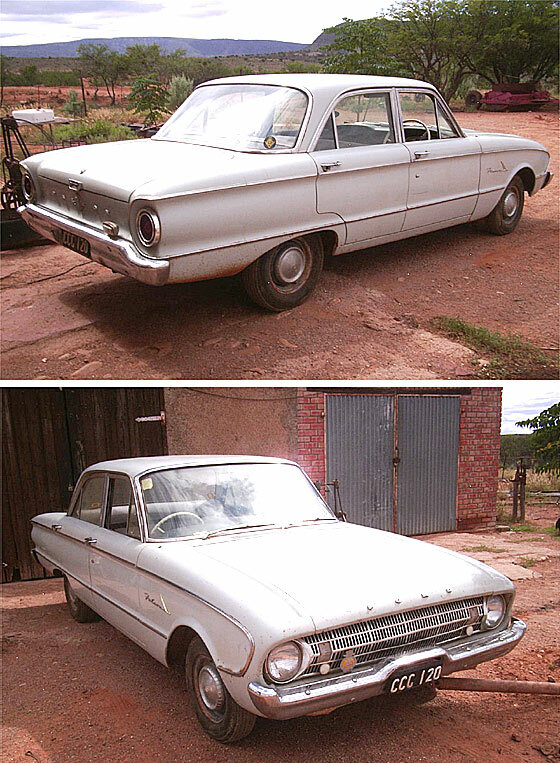 A couple of photos sent to us by Ernie Deyzel (South Africa) saying he has this 1963 Ford Falcon in original condition. Its brakes need to be repaired and he thinks the engine only needs a good cleanup (fuel lines). Ernie is in Port Elizabeth, in South Africa and wants R50 000-00 for the car. -- We don't now carry ads for cars because the situation is always changing. However, in this case we thought the photo is worth showing in the view of the stunning red countryside in the background ! 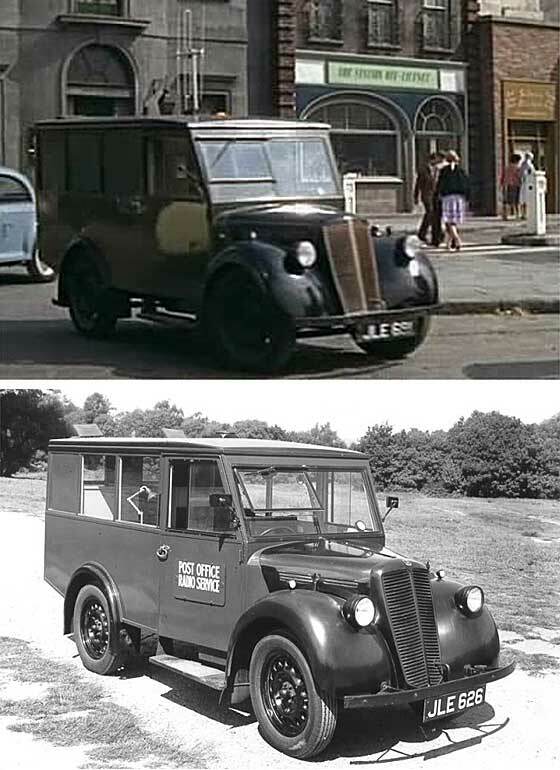 Photo submitted by Gordon Delchamps from Fredrick, Maryland, (USA) of a car in a London Parking lot, asking how he could find out the year, make, model, etc? 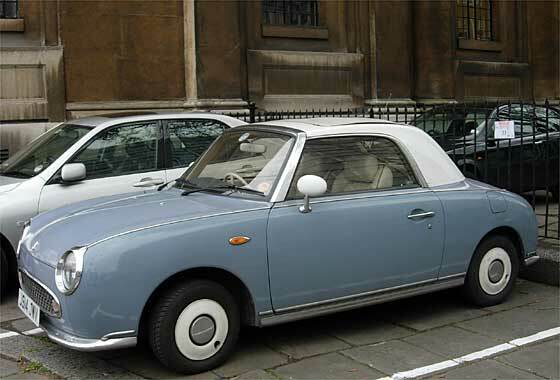 -- As we have had this question a couple of times we have decided to post the photo and advise that the car is a cca 1992 Nissan Figaro introduced 1989 Tokyo, 8,000 made. A further batch was made in 1991 of about 12,000 cars. One of UK's main Sunday morning political shows has presenter Andrew Marr driving one to work at BBC.